Symprove is a non-dairy probiotic drink that helps maintain a healthy digestive system and also replenishes the 'friendly' bacteria in the gut. I'm confused; I thought bacteria were supposed to be bad? In many cases they are, but it was discovered at the start of the 20th century that certain bacteria were beneficial to the gut by improving intestinal microbial balance, inhibiting pathogens and toxin producing bacteria. Symprove contains four species of naturally occurring friendly bacteria: L. rhamnosus, planatarum, acidophilus and E. faecium. Granted, they don't sound particularly friendly but these are among the most widely researched micro-organisms and have been found to play an important role in metabolic activity making them pretty much essential to our health. Symprove's four species of bacteria are grown on an extract of germinated barley. This barley contains a unique food source (prebiotic) providing ideal conditions for the bacteria to thrive and work effectively in the gut. 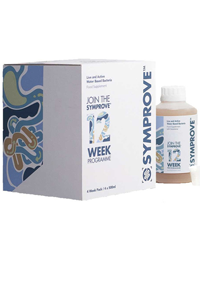 Unlike other, inferior probiotics, Symprove does not trigger digestion. This is down to its Unique Delivery System which protects the bacteria from stomach acids on their way down to the gut. Once in the gut, they quickly establish and build a healthy colony. It is recommended that food supplements containing live friendly bacteria are given three months to have a chance of taking effect. To that end, this 4-Pack will provide you with a more suitable amount at a more pocket friendly price. 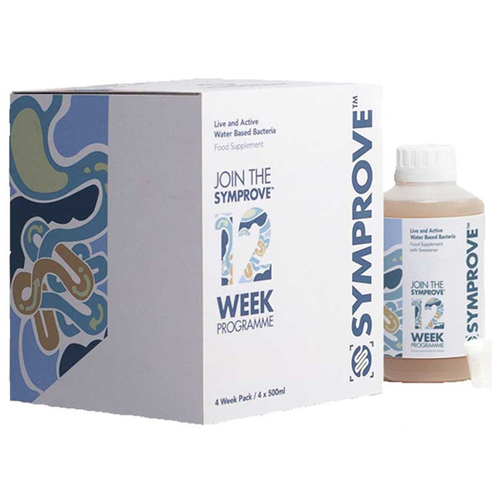 Remember to re-order your 4-Pack when you begin your last bottle of Symprove. Suggested use: Pour 1ml per kilo of your bodyweight into the measuring cup provided, wait 5 minutes to allow the friendly bacteria to pass through the stomach, and then have breakfast. Ingredients: water, extract of germinated barley, live activated cultures of L. rhamnosus, E. faecium, L. planatarum, L. acidophilus, vitamin c, preservatives: trisodium citrate, potassium sorbate. Symprove is non-dairy and gluten free with no added colours. Symprove should be stored at ambient temperature in a cool dark place. Once you open a bottle of Symprove, it should be popped in the fridge.